Format: 5 round random draw, untimed games. Plate: Morgan Choveaux/Nick Toyne, Ann Hogg/Shirley MacDonald. Plate: Annick Le Guen/Dirk Winnie, Katy Gatford/Tony Gatford. Plate: Brian Frampton/Lynne Shepherd, Barbara Johnston/Murray Johnston. Plate: Denise Bavidge/Geoff Greer, Brian Brdaburn/Claire Bradburn. Lew Gill/Shirley Selwyn 7, Myles Cowper/Michael Rocks 13. Murray Porter/Brian Smith 5, Myles Cowper/Michael Rocks 13. Sharon Cannon/Pete Hamilton 10, Myles Cowper/Michael Rocks 13. Denise Bavidge/Geoff Greeer 13, Ann Hogg/Shirley MacDonald 6. 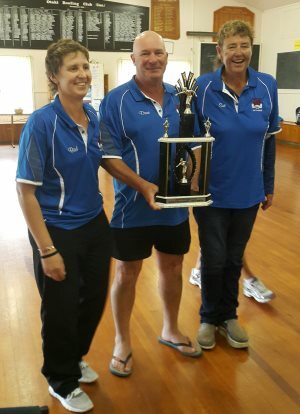 Kathy Gatford/Tony Gatford 2, Denise Bavidge/Geoff Greeer 13. Morgan Choveaux/Nick Toyne 13, Denise Bavidge/Geoff Greeer 3. Dave Gatchell/Barbara Nicholls 6, Yvonne Futcher/Tony Simpson 13. Dene Futcher/Sheryl Parslow 13, Yvonne Futcher/Tony Simpson 10. Jo Maxwell/Alan Taylor 12, Dene Futcher/Sheryl Parslow 13. Eddie Campbell/Brett Maguire 10, Paul Anderson/Margaret Pomana 13. Marlene Barker/Peter Blake 13, Paul Anderson/Margaret Pomana 3. Format: 6 round Swiss, 1 hour plus 2 ends. Allan Fletcher (Herne Bay)/Niau Ruta (Vikings)/Richard Swaney (Herne Bay), Christian Fouquet (Herne Bay)/Sylvain Karim/Thibault Marty (France), Charles Peni/David Peni/Seti Mailai (Panmure Pioneers), Joseph Tevpoo/Robert U/Francis Williams (Tahiti) 5 equal. Ian Baker/Bob Bridge/Raymon Pierce (Herne Bay), Pam Jenkins/Steve Lawry (Herne Bay)/Junior Puleitu (Vikings), August Lai/Milton Lo/Maurice Tim Yen (Tahiti), Thierry Pannetier (Herne Bay)/Bill Peachey (Vikings)/Selwyn Sainty (Herne Bay) 5 equal. Richard Browne (Ashburton)/Colin Bunce/Marilyn Bunce (Alexandra), Christian Fuchon/Raymon Teremata/Lauren Yen Kway (Tahiti) 3 equal. Hayden Baucke/Regan Baucke/Trevor Neilson (Gemini), Nick Borland/Sam Borland/Brendon Meyer (Auckland) 5 equal. Naomi Ader (NZ)/Tumata Pere (Tahiti), Vaiata Ebb/Sylvie Jennins (Tahiti) 3 equal. Sharon Cannon (Bay View)/Annick Le Guen (Kapiti), Renee Noel (Vikings)/Fay Tikey (Hibiscus Coast) 3 equal. Angela Maxted (Kennedy Park)/Ann Shields (Herne Bay), Ros Morton/Trish Ritman (Herne Bay) 3 equal. Ann Clayworth/Claire Matthews (Northcote), Virginia Kirk-Smith (Herne Bay)/Eileen Lippard (Kennedy Park) 3 equal. Ella Harris/Julie Leadbeater (Northcote) 2. Played at the Masteron Pétanque club. Format: 5 round random draw, 60 minutes, plus 2 ends. Format: Round robin. 60 minutes, plus 2 ends. Sharon Cannon/Murray Porter/Brian Smith 13, Denise Bavidge/Geoff Greer/Gordon Ogden 1. Maurice Belz/Myles Cowper/Michael Rocks 13, Sharon Cannon/Murray Porter/Brian Smith 10. Yvonne Futcher/Christine Strichen/Claire Wilson 13, Murray Johnston/Joan Miller/Ralph Priddle 9. Dave Gatchell/Lew Gill/Shirley Selwyn 8, Yvonne Futcher/Christine Strichen/Claire Wilson 13. Diane Fletcher/Barbara Nicholls/Graeme Pilcher 13, Dez Grant/Lee Tafford/Sarah-Jane Wright 7. Format: 5 round Swiss. Time limit: 60 minutes, no extra ends. Format: 5 round Snake, untimed games. Levi Booth/Bob Bridge/Lee Tafford lost to Dave Gatchell/Pete Hamilton/Peter Horgan. Sharon Cannon/Dez Grant/Sara-Jane Wright 9, Dave Gatchell/Pete Hamilton/Peter Horgan 13. John O'Halloran/Carole Rowsell/Mark Thompson 13, Mararet Harkness/Eddie King/John Maxwell 9. Annick Le Guen/Christine Strichen/Claire Wilson 13, John O'Halloran/Carole Rowsell/Mark Thompson 4. Jack Gazzard/Linda Gazzard 7, Kath Alison/Michael Rocks 13. Gabi Kinnell/John Pallesen 11, Kath Alison/Michael Rocks 12. Erica Drake/Doc Murray 13, Jack Gazzard/Linda Gazzard 5. Bob Horton/Lynley Watt 13, Mike Kennedy/Alison Zuppicich 4. Barbara Nicholls/Brian Smith 13, Bob Horton/Lynley Watt 11. Kathy Taylor/Dave Wilmshurst 8, Mike Kennedy/Alison Zuppicich 13. Wayne Green/Colleen Horton 13, Peter Dennett/Catherine Maher 12. Simon Grant/Robin Mann 13, Wayne Green/Colleen Horton 8. Marilyn Trembath/Tony Trembath 5, Peter Dennett/Catherine Maher 13. Format: 5 round random draw. Format: 5 round Snake. Timed games 50 minutes, plus 1 end. Format: Round robin. 50 minutes, plus 1 end. Format: Knockout. 50 minutes, plus 1 end for quarter-final, untimed for semi-final and final. Dez Grant/Sarah-Jane Wright beat Steve Frampton/Brett Maguire. Sharon Cannon/Lee Tafford lost to Dez Grant/Sarah-Jane Wright. Murray Porter/Brian Smith 4, Dez Grant/Sarah-Jane Wright 13. Dave Gatchell/Michael Rocks 13, Andrew Joe/Richard Turfrey 1. Joan Miller/Claire Wilson 13, Dave Gatchell/Michael Rocks 7. Annick Le Guen/Christine Strichen beat Joan Miller/Claire Wilson. Format: Five round random draw. Format: 5 round Snake. Untimed games. Format: Round robin. Untimed games. Plate: Roger Brown/Grant Gardiner, Margaret Harkness/Ian Hay. Plate: Dave Gatchell/Peter Hamilton, Ann Hogg/Richard Turfrey. Plate: Brett Maguire/Alan Taylor, Robin Johnson/John O’Halloran. Plate: Barb Johnson/Murray Johnson, Jo Maxwell/Lynne Shepherd. Myles Cowper/Michael Rocks 13, Lee Taffard/Nick Toyne 9. Murray Porter/Brian Smith 13, Myles Cowper/Michael Rocks 7. Annick Le Guen/Claire Wilson 3, Murray Porter/Brian Smith 13. Barb Johnson/Murray Johnson 13, Robin Johnson/John O’Halloran 4. Dave Gatchell/Peter Hamilton 13, Barb Johnson/Murray Johnson 7. Roger Brown/Grant Gardiner 8, Dave Gatchell/Peter Hamilton 13. Dean Norman/Susan Norman 13, David Corley/Noeline Corley 3. Vicky Cox/Robert Wilson 10, Dean Norman/Susan Norman 13. John Clark/Sheila Clark 12, Kathy Gatford/Tony Gatford 13. Maureen Cresswell/Jill Forsdick 5, Kathy Gatford/Tony Gatford 13. Format: 55 minute timed games, plus 1 end. Format: 5 round random draw, 60 minutes plus 2 ends. Semi-final timed (60 minutes plus 2 ends). Finals were untimed games. Barbara Johnston/Murray Johnston/Ralph Priddle 13, Annick Le Guen/Christine Strichen/Dirk Winnie 8. Maurice Belz/Myles Cowper 13, Barbara Johnston/Murray Johnston/Ralph Priddle 0. Yvonne Futcher/Kevin McFadgen/Sheryl McFadgen 10, Sharon Cannon/Pete Hamilton/Claire Wilson 13. Ben Toyne/Maree Toyne/Nico Toyne 2, Sharon Cannon/Pete Hamilton/Claire Wilson 13. Format: 5 round random draw. Timed games 60 minutes plus no extra ends, draws permitted.